Have a look over Willaiam Hill Poker Lobby and just below of that find – How to Navigate Willaiam Hill Lobby? William Hill Poker Lobby is well-ordered with an easy dropdown menu for navigation, showing the limits, flop percentages, hands played per hour, number of players, number waiting and hands played per hour. The drop down menu is categorized by game and stake as well, acting as a lobby filter and reducing the games shown to only those you wish to play. William Hill Poker Lobby also supports game history, chat blocking and players notes. Also, the lobby has a proposition program, offering you the opportunity to get paid to play poker. Every so often, you will be asked to accept an offer to launch new William Hill Poker Table (for certain amount). On your consent, you will be given that amount (mostly an hourly rate). The Main View Menu is used to access your account, watch over the latest news and offers, search for new players, contact online support, view William Hill Poker contact info, configure personalized options and access the help section. 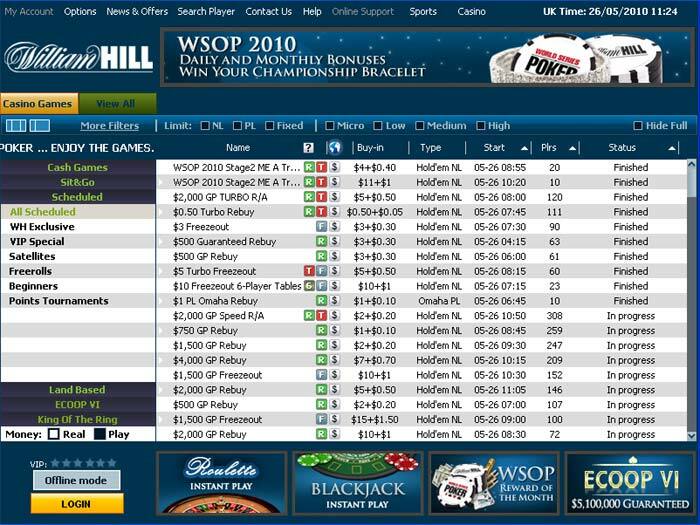 The View All tab is used to return the players to the default William Hill Poker Lobby view, showing tournament details or cash table in the main schedule (based on last viewed). Quick seat option is used to find a suitable table or tournament, by choosing a couple of basic options. When you open the Quick Seat for the first time, the choices for the first two columns are chosen by default. While changing any options, options in the next columns will change accordingly. To hide the options columns, unselect the radio buttons. For instance if you unselect the no-limit option in column three, only the headings for column four and five will be shown. However, you can’t unselect the first two columns. You always need to choose a format and game type. If you only choose the first two columns while clicking the Seat Me option, then you will be taken into a random table. William Hill Poker Lobby software memorizes your previous options and displays the same options when you open the quick seat options.